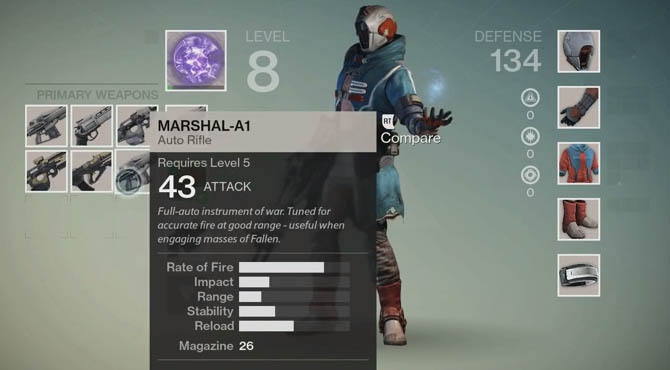 To fight at the highest level in Destiny you need to upgrade your weapons as well as finding new weapons. Every weapon in the game has at least one upgrade path but rare gear such as Legendary type weapons have multiple upgrade paths. Learn how to upgrade your weapons and find new ones by reading the guide below. 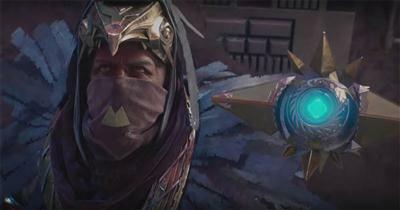 The first thing to understand about Destiny is the Combat stat. Every character in the game has Combat stats which are calculated from weapon strength and armour proficiency. These stats are split into two groups: Attack and Defence. 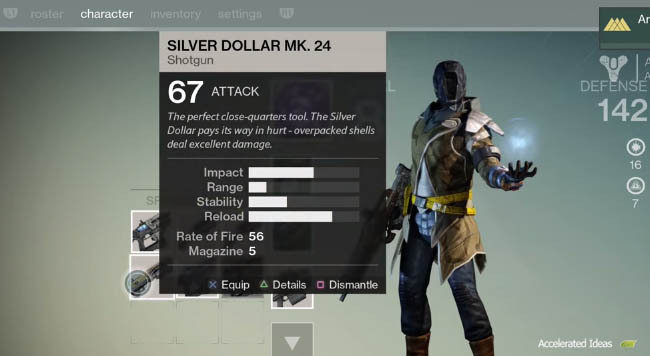 The total Combat value is derived from the level and rarity of your gear - bigger numbers are better in Destiny. Higher quality weapons (and armour) have upgrades that can be unlocked to boost the Attack statistic of a weapon of the Defence stat of armour. Upgrading a low level weapon won't keep it up to date for long and you'll want to acquire higher level items, such as Legendary gear for more upgrade paths. Every weapon has a base damage rating (Impact) but you can increase that value by progressing the Attack stat. In PvE (humans vs enemies), Level Advantages mean that your Attack stat is combined with your rank level to decide on the overall damage you'll inflict on enemies. This is why it's so important to upgrade your weapon before venturing into high level missions otherwise you'll deal less damage and suffer more yourself. If you have uncommon (or better) weapons and armour, any experience you earn in the game goes towards unlocking mods on those items. You earn experience in different way such as killing enemies, completing missions, earning bounties etc.. Unlike other games you don't have to physically build anything or take your weapons to anyone to upgrade them. However, you do have to spend Glimmer and Materials to activate a particular mod (once you've acquired enough experience using the weapon/armour). There are five types of gear in the game: Common, Uncommon, Rare, Legendary and Exotic. Each type has a colour making it easy to distinguish in the game. You'll see the background colours when you hover over the item in your inventory. Tip: You should equip weapons and armour you want upgrade before claiming your reward from a mission or bounty, otherwise the upgrade goes to waste. I wouldn't worry too much about maxing out your weapons with experience, Materials and Glimmer before level 20 because you'll want to replace your entire inventory with Legendary weapons for the Raids. Instead, keep a weapon going until you find the next level up i.e. Uncommon to Rare, and then keep repeating that cycle. Once you do reach Level 20, you can invest all your time in customizing the weapon to your liking and you'll have many more upgrade paths to choose from. Coded Engrams are special glowing crystals that can help you find new weapons and armour. You can pick up Engrams dropped by defeated enemies with Majors and Ultras being the most likely enemies to drop them. An Engram displays the type of item it relates to, but the exact location of the Engram is only revealed after you take the Engram to the Cryptarch in the Tower. You can acquire all sorts of weapons including primary, special, heavy weapons and even armour. Cashing in Engrams raises your reputation with the Cryptarch meaning that later in the game you can even buy Engrams to cheat your way to better weapons. You'll also find that the rarity of items is not always linked to the rarity of the Engram - so you could find a Legendary weapon inside a Rare Engram.